The first thing I did after I bought my iPad 2 was browse the iTunes store for Educational Apps. I was looking for free ones to start. There are so many out there, it's hard to know what is good and what isn't! 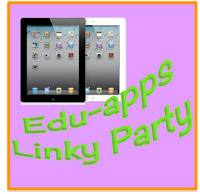 So when I came across the Linky Party for Educational Apps that is being hosted by Jane at The Learning Curve blog, I thought it would be a great way for me to share ones I know of and to learn about others as well. 1. Edmodo - I love Edmodo and being able to use it when I'm not physically sitting at my computer is awesome. This app gives me just about all the same functionality that I get when signed on regularly. If you aren't sure what Edmodo is, you can read about my post I did on it a few weeks ago. 2. Educreations - THIS ONE IS FABULOUS! Basically, it is a generic interactive whiteboard. It allows you to record, write and import pictures to teach your lesson. You can then save your lesson and make it available to other teachers or even your students for when they are at home. What a great resource if you have an absent student or someone who needs a quick review. You can even browse by subject, other lessons that have been done. 3. YourTeacher: Math - This is a collection of math videos that teach. Search for the concept you are looking for and just play the video. 4. Timer+ - This one isn't really an Edu App but I love it just the same. It allows me to create different timers for activities. So I have saved timers for all my stations, warm-up activities, etc. 5. Stack the States - This game is so much fun! And it's perfect if you have to teach the states to your class. It gives them trivia questions regarding the states....they range from Nicknames to names of the Capitals and more. The lite version is free. What are your favorite Educational Apps? Join the Linky Party or just post below. I haven't even heard of some of these apps so I will be sure to check them out. It is quite overwhelming when you look at huge lists so it is good to hear when someone has found them useful. Just stopping by to tell you I love your blog and I've passed on an award to you. Stop by my page to get the details! !